Life just gets more and more interesting here in Mahahual. Yesterday was just another lazy, sunny day here in Mahahual, and I was doing my usual Saturday routine, sitting at the Tropicante on the beach talking to tourists from the USA and Canada. I noticed four people walk up, and I looked and asked them if they were from the USA, they looked like Americans, and one guy answers me back in English, no why would you say that, and I said, we don’t get many Americans this time of year in Mahahual, so you must be Canadian. He laughed and said no, we are from Maine, he was just kidding. They stopped in and we got to talking, and come to find out two of them were father and daughter, Wendy Morrill and Richard Bailey. I asked them if this was their first time in Mahahual, and they said no, in fact they walked through Mahahual awhile back, and she wrote a book about it “The Found World of Quintana Roo”. Wendy told me she walked all the way from Cancun to Belize with her father, just like the guy in the book “The Lost World of Quintana Roo”. Wendy Morrill and her father Richard Bailey. My jaw dropped, because that is one of my favorite books, and it is a must read if you ever considered living or, are now living in Mahahual and Quintana Roo. I have written several articles about this book on this blog, and I tell everyone I know about it, and encourage them to read. In fact, there is one copy Nancy has at the Tropicante book store that she is holding for a surgeon from Texas here because we were talking about it the other night. I just got a copy of the book back from Xcalak, that I let someone borrow, and I am reading again it for the third time. If you want more information about the book “The Lost World of Quintana Roo”, (if you have not heard of it before, or did not read my article about it), you can go into the archives of this blog and find it there. Wendy told me she was inspired by reading the book, and her father also is an avid hiker, so they decided to repeat and follow in the footsteps and take the exact route in the book, like the author did in the late 1950s, when Quintana Roo was just a territory of Mexico. They camped the whole time, and all they had was a hammock, machete, and a mosquito net. They walked the whole way, and one time even had to build a raft. They did this between 2007 and 2011, and would each May come to Mexico and walk for a whole month, then come back the next year and pick up where they left off. I think she said they walked like 120 miles a week, with no other means of transportation, just walking. Wendy informed me that her book should be coming out in June of this year,m and she will be coming back to Mahahual some time after the book is published and do a book signing here. I told her when her book comes out she will be a big celebrity here in Mahahual, because everybody I know here has read, or heard of the original book. What I also liked about her and her group from Maine is, they love Mahahual and are thinking of retiring here some day She and her group were great to talk to, and I think they would fit in here in Mahahual quite nicely. I told her would probably never have to buy a drink the whole time she was in Mahahual after her book comes out. You never know who you might run into sitting on the beaches of Mahahual. I will be sharing more in the future when the book is published, and how maybe you can get a copy. If you want more information go the website and you can read some excerpts from the book. Today I am going to an update on some of the things I have written about in the past, and some new things that are popping up around Mahahual. One of the topics I will get into is transportation, and in fact I am going to add a transportation category on the tool bar on the right hand side of the blog. I have different categories there like cruise ships, real estate, life, and other factors about life here. I am getting a lot of questions and comments concerning transportation, and how to get to Mahahual now. The majority of them are concerning how to get to Mahahual in one day from the Cancun airport. In the past I have written about the ADO shuttle from Playa del Carmen to Mahahual, as a good way to get to Mahahual. Just to inform those who may be using that in the future, there have been some changes. The ADO shuttle now leaves from Fernando’s hostel and store in the center of town, and it also drops off people there. This has changed from Quinta Sol where the ADO shuttle stopped in the past. You can also buy tickets at Fernando’s for the shuttle. The hours are still the same, but different location in Mahahual. Also the airport in Chetumal is now an international airport, and should start accepting international flights, and flights from Central and South America. The runways are now expanded, and a lot of major improvements are in store for the future. 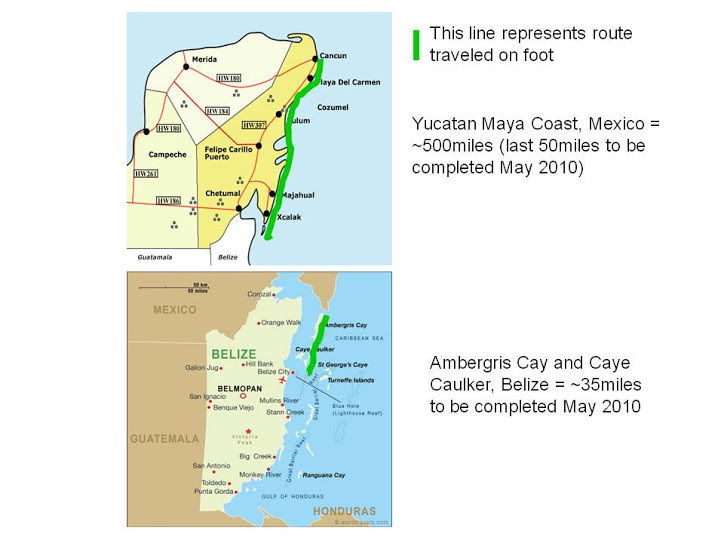 This will also become another alternative in the future for getting to Mahahual. Also I think this will attract a lot of Mexican tourists from places like Mexico City, Veracruz, and other big cities in Mexico. I have met a lot of people from Mexico City who flew into Chetumal, and came to Mahahual to vacation this year, much more than in past years that I have been here. There were a lot during this past Semana Santa, and I got to talk to a lot of them. They all told me that Mahahual is being talked about a lot in Mexico City, and developing into quite a popular beach tourist destination for the residents there. There are also several companies that are now expanding their transportation companies into including Mahahual in their routes. One of these is AGI shuttle service out of Cancun, and they come direct to Mahahual from the Cancun airport on the weekends. One of my blog readers used them a couple of weeks ago, and they got him here from the airport, and then when he left, they took him back to Isla Mujeres. Most people fly into Cancun on the weekends from the USA, so this is a good viable option now tp get to Mahahual in one day. I have got a lot of comments lately that people are tired of staying in Playa del Carmen or Cancun for a night and then coming to Mahahual. They want to get to Mahahual as quick as they can to so they can enjoy Mahahual as much as possible. I will have updates on this and other transportation options in the future. Another thing I have noticed this year different from years past is, there are a lot more Americans showing up this year during low season than in the past. Everyday I meet more and more Americans who are flying into Cancun, renting a car, and then driving to Mahahual. Yesterday I met a party of 19 people from Utah staying at Maya Palms, who were here diving for the week. I also met a group of people the other day, who bought some land up in Sian Kaan, and the homeowners group is staying in Mahahual, and came by and looked me up at the Tropicante. I was surprised that they all read this blog, and they had some drinks and sat around and asked questions about living here, and things like that, nice people, all Americans. Mahahual has also been discovered by a lot of expats from Playa del Carmen. I meet Americans who live in either Cozumel, or Playa del Carmen every day. They are scouting around down here looking for land or houses. In fact, I met a couple of guys last night down from Playa del Carmen wanting to look at some real estate. Poor guys, their car broke down as soon as they pulled into Mahahual, and the guys on the street had to help push the car onto the athletic field. I answered some questions for them, gave them some maps, and told them when they get their car fixed come pick me up and I will show them around. They also told me what I hear all the time from expats from Playa del Carmen…..Playa del Carmen has gotten too big and commercial, and they are looking for something a lot less more quiet and not crowded. I spent a lot of time last year in Playa del Carmen, and I heard the same thing there a lot from the expats I knew there. Everytime I went out in Playa del Carmen to the expat’s hangouts like Mom’s, Bad Boy’s on the Beach, and others, when people found out I was from Mahahual they immediately would ask me questions all about the beaches, homes, land, and living in Mahahual. This is another market that I think is going to become a part of Mahahual’s future and economic growth, because Mahahual is a perfect place for expats to live. Well that is all I have today, I have to go and meet some blog readers on the beach at the Tropicante, and hang out with them. (Man I have a rough life). I will have some more updates in the near future about things like the water park construction, new properties and builders in Mahahual, and an update on all the increase in cruise ship traffic this coming season. Here are some quick Mexican Idioms I came across the other day. It was a long list, so I copied some that I find funny or interesting. These are a form of slang, so most Mexican readers will be used to some of these. I am going to try to remember some of these in the future, and try to use them. Definition and Use: Mainly used to suggest someone is exaggerating their story. Definition and Uses: You are using a lot of resources to reach small goals. Definition and Uses: When you are good to someone and they later expect too much of you and become demanding. To harm, become demanding of, or expect too much of someone that is good to you. Definition and Uses: When a person (usually friend or someone you know) moves in with someone without contributing financially, the relationship between these will end badly. Definition and Uses: The things that you do result in negative consequences. Definition and Uses: If you leave things to the last minute, the opportunity is lost. Definition and Use: Tend to your business otherwise you could go broke. It can also be used if someone’s wife is being ‘neglected’. Definition and Uses: The bad habits you pick up from those you hang around with. Definition and Uses: This one is about leadership and individuality, where one person takes charge and the others follow. Definition and Uses: Your wrong doings will eventually be revealed. I get this question all the time, what can I bring into Mexico through customs. Here is a list of some food items you can bring back with you through customs. I got this article from http://www.theplayatimes.com and it goes into detail what spices and foods you are allowed to bring into Mexico. I am kind of surprised at all the different foods you can bring with you back from the states. All of us have come back to Cancun Airport from a trip away or directly from our home in another country, wanting to bring some things to Mexico. However, you have surely been nervous about the red/green button that customs make you press upon re-entry, which determines whether you get your bag searched or not. Do not stress anymore about having your goods confiscated as we are providing you with a summary of the products you can bring in according to the department of SENASICA (National Service of Health, Food Safety and Quality). Our list is not exhaustive. You can find the full list in detail, along with further information from http://www.senasica.gob.mx, download the form “List Products with Regulations and Prohibited Products”, which specifies which products require special permits, the quantity of these products you can import, the authorized producer country for these products, and those for which you will need to fill out a customs declaration form. One last tip: Keep up to date with the news, as the status of these foods may change in the case of disease or plagues, illness outbreaks in any country. Vegetables and dried fruit in airtight containers. Roasted coffee in airtight containers. Dried and salted pistachios and walnuts. Spices such as vanilla, cinnamon, ginger, cloves, nutmeg, cardamom, anise, coriander, fennel, saffron, turmeric, thyme, laurel, curry, etc. Packaged cheeses (3 kg per family), excluding fresh cheese. Butter, cream, (1 kg per family) and yogurt (1 litre per family). Pasteurized liquid milk (1 gallon per family), condensed (1 litre or 3 cans or 3 tetra packs of 12 fl. oz. per family), powder (2 kg) and infant (5 kg). Serrano ham, cured ham, cured pork sausage, thermally processed poultry and pork (all 5 kg). Dried beef (500g per family). Fully processed food preparations containing meat, egg, honey and/or dairy (4 kg per family). Pate of any kind (1 kg per family). Smoked turkey or chicken (6 kg per family). Wet feed for animals (10 lb or 5 kg per family). Frozen or iced fresh fish, canned, bottled, cooked and other presentations. Dried, cooked or smoked squid, octopus, snail, sea cucumber. Dried, smoked oysters in brine. The above listed animal products can only be imported from specific producing countries, for which each category of product has their own set list of authorized countries. Dried, fresh or frozen pork or poultry meat. Fresh, refrigerated or frozen beef. Seafood platters, raw and/or cooked. All cooked crustaceans and seaweed in any form. Fish products in sauces, dried bone, fried. If you have any questions about specific products not on the list (note for all the British: there is a worrying absence of tea on the list! ), you can contact the Citizen Services of SENASICA at the following number: 01 800 987 9879. I am noticing more and more Belizeans are showing up in Mahahual lately to enjoy the beaches here. I have met more people from Belize in Mahahual this year than any other year in the past. I think Mahahual is becoming a major tourist destination to a lot of Belizeans. As many of you know who have read this blog, I have spent some time in Belize, and lived there. Besides the islands there are not many good beaches in Belize, and because of this more and more Belizeans are coming to Mahahual on their holidays. Today, besides being Memorial Day in the USA, also is a Belize holiday. I am not sure which holiday it is, (between Mexican and Belizean holidays I get confused because there are so many) and it seems to me like every day is a holiday here sometimes. This past weekend there has been a lot of Belizeans in town because of the long holiday weekend. Yesterday I met a group of people from Belize City, and several of them were members of the Belizean Tourist Police. They were all staying at the Hotel Mahahual on the malecon, and I had a chance to talk to them. We got to talking and the guys with the tourism police in Belize, told me they are really trying to crack down on crime in Belize, and they now are heavily screening who gets in and out of the country now. I asked them that I heard they were turning people away at the border a lot now. They told me if you do not have a good reason to cross the border into Belize now, you will have problems. They are asking people now if the have hotel reservations or places to stay before they allow people into the country now. Mahahual is not really that far from Belize by car, and more and more Belizeans are now taking advantage of this. A couple of weekends ago there was a couple of big tour busses with a group of Belizean teachers in town for the weekend. On Easter Sunday there were Belizeans everywhere on the beaches of Mahahual. I met some from Libertad, Belize that I knew from when I lived in Corozal. I have met Belizeans from Corozal, Orange Walk, San Pedro, Belmopan, and just about every other city in Belize the last couple of months here, much more so than in the past. Belizeans are very nice people, and they like to talk and have a good time. You can easily spot them on the malecon, especially if they are speaking Creole, when they walk by. They always stop and talk to me and ask me questions, and when they find out I used to live in Belize, they treat me like a long lost cousin. A lot of them I notice are here for the first time, and I am sure they will be back. I know when I lived in Belize, I never heard of Mahahaul the whole time I was there, and only heard about it when I went to Chetumal. You can also get to Mahahual by bus very cheap from Belize. I have also noticed more and more Belizean busses in town this year. That is a tourist market that I think is going to grow a lot in the future. You can get to Mahahual from almost anywhere in northern and central Belize in about 3 hours drive time, which makes for a perfect weekend tourist destination. You can arrive in Mahahual on Friday night or Saturday morning, and stay until Monday afternoon, and drive back to Belize. This is perfect for a long holiday weekend. I think Mahahual will continue to attract Belizeans in the future, and become a major tourist destination for Belizeans who want to experience Mahahual’s beautiful and pristine beaches. This is a post I did after my first year in Mahahual. I wrote this before I started the blog http://www.costamayalife.com. It was written on the blog I started when I was living and working in Belize. 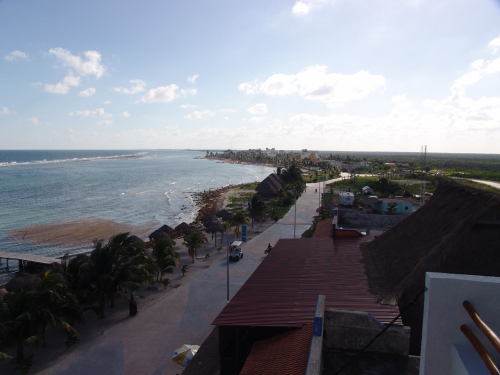 It is basically looking back at my first year in Mahahual, and my first impressions and experiences here. I found this in my archives, and thought I would share today. For any of you wondering, it tells the story of how I ended up in Mahahual. I came across this when I was searching through my archives, and realized nothing much has changed in my impressions of Mahahual since I first arrived here. I also have some photos I will share later. I am reblogging this post today, because if you have ever thought of living, or are now living, or even considering coming to Mahahual and Quintana Roo, this book is a must read. I noticed this morning that Nancy at the Tropicante book store has a copy of this book. This book is very hard to find, and it describes the coast of Quintana Roo in the 1950s before roads and civikization arrived. I have told everybody I know about this book, and if you can find it, read it. I have read it twice, and I can relate, I may have to read it again. “The Lost World of Quintana Roo” out of print today. If you have ever wanted to visit the Mexican Caribbean, or even considering retiring or living in Quintana Roo, this book is a must read. This book tells of a young Frenchmen’s journey and quest down the Mexican Caribbean from Cozumel to Belize in 1958. The book is not published anymore, and a friend gave me his old copy to read, and it was fascinating.